“I had three quotes for similar radiators to replace storage heaters. I am very glad that I chose these. The advisor took time to go through everything in detail and was not pushy. They are excellent quality. The price was lower than others by a substantial amount, the delivery arrived next day. 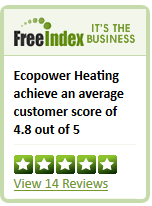 I had Ecopower economiser radiators installed in two rental properties replacing old electric heaters. The radiators are electric and were wired directly in to the old positions. Operation is as easy as a normal central heating system. They look unlike electric heaters and have a more modern appearance. The control system is ideal for the purposes of tenants. We have had positive feedback from our tenants about both the warmth and the energy saving. Sally Joanne Walker – Penrith.